According to recent research presented at the 125th Annual Convention of the American Psychological Association, loneliness isn’t just affecting our mental and emotional health as previously believed. It was revealed that socially isolated individuals actually are at a higher risk for a variety of physical health concerns, including weaker immune systems, increased blood pressure and heart disease. In fact, the research states that loneliness might have a greater impact on your overall health than obesity, smoking, exercise or your nutrition habits. Everyone feels isolated and lonely from time to time. Missing friends who have moved away or family members we don’t get to see often enough is a common feeling. Humans are social species, and the effects of being alone for extended periods of time causes your body and your brain to go into “high-alert” mode. This increases levels of the stress hormone, cortisol, which in turn increases your risk for high blood pressure and heart attacks. Not only that, but loneliness can make it difficult for individuals to take proper care of their health. For example, studies show that seniors who eat alone tend to make poorer food choices or skip meals altogether, leading to malnutrition and a decline in physical activity. When seniors don’t eat healthy meals, they have less energy for regular exercise, which puts them at more risk for chronic conditions like osteoporosis or osteoarthritis. It also increases their chances of falling. In addition to these negative physical effects, socially isolated seniors tend to experience more cognitive decline and memory loss. Given all of the above, it’s easy to see how loneliness can lead to a downward spiral in your health. A study commissioned by AARP found that 35 percent of adults age 45 and older are lonely. This means over 42 million Americans are suffering from chronic loneliness that could deeply impact their quality of life. There’s good news, however! Making the decision to move to a senior living community can greatly expand your support network and allow you to enjoy the benefits of an engaging, socially active lifestyle. 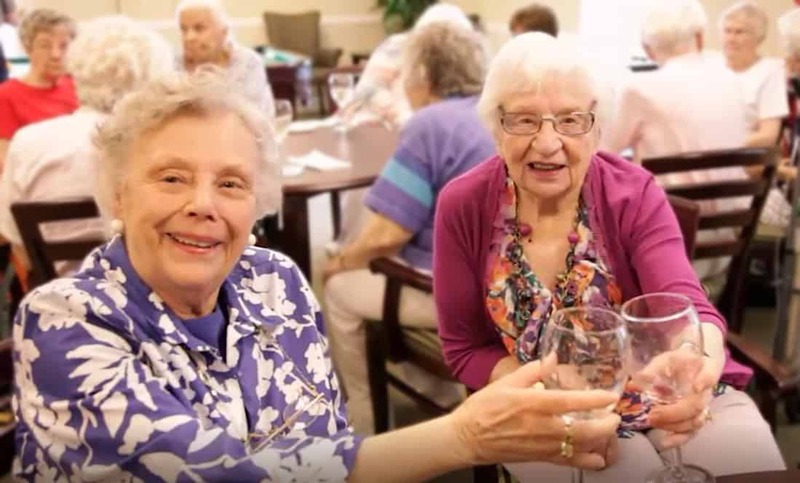 In a retirement neighborhood, you are provided countless opportunities to continue to develop connections and build relationships with both your neighbors and the staff that is available to offer support when needed. When you’re surrounded by people and spending time with others who share similar interests, you’ll naturally become more active, which could support a longer, healthier life. Take it from current Silver Maples resident Jean Magee, who knew her life would be taking a turn when she moved to our retirement neighborhood in 2009. As she prepared to downsize her home, she gave away some of her personal items, including her collection of jewelry, which she figured she would no longer have much use for. After settling in however, Jean found she hadn’t moved to a quiet, serene retirement community; she’d moved to a vibrant community bustling with activities, including lots of social occasions. “When I got here, I found they had all these parties. Everyone gets dressed up…I needed my jewelry!” Jean laughed. It’s true – you’ll never be short on social opportunities at Silver Maples. From life-enriching activities like art classes, travelogues or trips to local theatres and museums, to fitness classes at the Chelsea Wellness Center, holiday gatherings and Friday afternoon Happy Hours, loneliness is rarely a concern at our retirement neighborhood. Check out some of the personal insights and testimonials shared from residents, their families, community members, and our staff, or contact us today to schedule your personal tour of our beautiful retirement neighborhood in Chelsea, Michigan.